Marcomm economics have reached a breaking point: advertising costs are soaring - up 40% on average - while reach is plummeting. Brands are spending a lot more to get a lot less. As a result, concerned marketers are reviewing their advertising spend. In fact, more spend is being questioned now than in the last three years combined. Marketing leaders are testing new technologies, new channels, and new ways to catch consumers' attention. But all this comes at a price. Experimenting with new media is risky, expensive, and it can be hard to get consensus among internal stakeholders. We analyzed over 250 marcomm initiatives from around the world to see what sets the best campaigns apart. 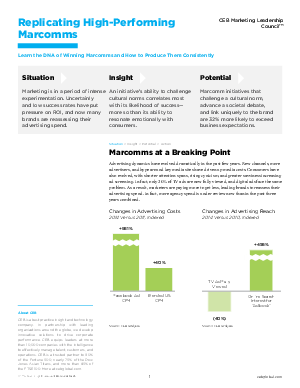 Download “Replicating High-Performing Marcomms”, to learn the key components to build a winning campaign.